To me, a pedant and a purist, a pickle by rights ought to have gone through a proper fermentation. It might have been pasteurised afterwards and bottled, but at some stage it needs to have supported microbial activity. And yet, I don’t think of kombucha as pickled tea or yoghurt as pickled milk. Maybe that’s because they aren’t salted. Just being boiled in vinegar or soaked in brine doesn’t qualify either, for me. Luckily Jan Davison, author of Pickles: A Global History, has a much more open mind, which is great, because I learned a lot from her little book. And it gave us plenty to talk about. However, there was plenty we didn’t talk about, or at least not in detail. Sushi I had no idea about the history of sushi, so I went looking. * From the bibliography in Jan’s book, I found Traditional Japanese Foods and the Mystery of Fermentation, which in turn led me to Food Culture, a journal published by Kikkoman. That will keep me occupied for years. * Far less demanding, a little article on Fermented Sushi, the origin of Sushi. * And if that gives you a taste for the real thing, Tokuyamazushi: Wild dining from lake and forest in Shiga in The Japan Times has the lowdown. Refrigerator pickles Again, my ignorance knows no bounds. So while I have been perfectly happy slicing cucumbers and onions, sprinkling them with a bit of salt and leaving them in the fridge overnight, I’ve never thought of them as pickles. There are scores and scores of recipes for such things; I’ll leave finding them as an exercise. Piccalilli Truly, I had forgotten the delight of mixing bright yellow picalilli into the mash that invariably accompanied English sausages in my youth. I like to think it was about taste as much as it was about colour, but I may be fooling myself. 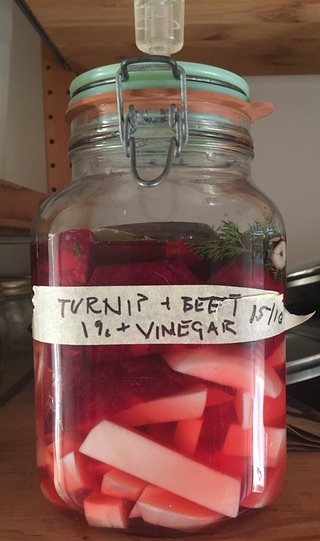 While I have never made my own, I am resolved to give it a go, using the recipe and instructions shared by my friend Katie Venner at Tracebridge in Somerset. They give lessons too, in fermentation and sourdough. If you haven’t already seen it, Samin Nosrat’s wonderful series on Netflix is a joy. Episode Two, on salt, has a fair bit on Japanese pickles. Photos by me, in Izmir, Turkey, and at home. Thanks Jeremy for the mention! Great to hear Jane and if I don’t win her book (!) ill buy it! Funnily enough I posted a pic of my Piccalilli on Insta today! The Story of Sandra Marie liked this article on twitter.com. Aaron Davis listened to this article (via collect.readwriterespond.com). Rhizowen liked this article on twitter.com. petit Famous 🌿📐🖍🌋 reposted this article on twitter.com. Jan Davison has written Pickles: A Global History, the perfect accompaniment to her previous book, English Sausages.